What is style in architecture? "Style is like a feather in a woman's hat, nothing more," said Le Corbusier, expressing most modern architects' low regard for the subject. But Witold Rybczynski disagrees, and in this book, makes a compelling case for the importance of style to the mother of the arts. 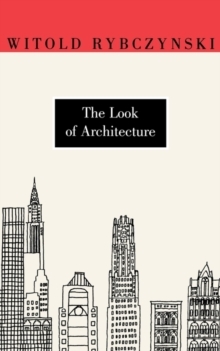 This is a book brimming with observations - that form does not follow function; that the best architecture is not timeless but precisely of its time; that details do not merely complement the architecture - details are the architecture. But the heart of the book illuminates the connection between architecture, interior decoration and fashion. Style is the language of architecture, Rybczynski writes, and fashion represents the wide - and swirling - cultural currents that shape and direct that language. The two, style and fashion, are intimately linked - indeed, architecture cannot escape fashion. To set these ideas in sharp relief, he shows us how style and fashion have been expressed in the work of major architects - including Frank Gehry, Mies van der Rohe, Charles McKim, Allan Greenberg, Robert Venturi, Enrique Norten and many others. He helps us see their works anew and ultimately to look afresh at our surroundings. Style is one of the enduring and endearing aspects of architecture, Rybczynski concludes. Furthermore, an architecture that recognizes the importance of style would not be as introspective and self-referential as are so many contemporary buildings. It would be part of the world - not architecture for architects, but for the rest of us.